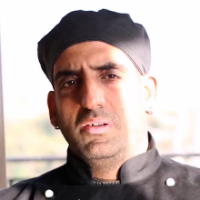 Rahul Wali has done diploma in HM from Pune and graduate diploma in Gastronomy from Adelaide, South Australia. He has worked in multiple hotels in India and abroad. He is presently running his own Cafe by name of Rahul’s Kitchen, Dehradun and he has total 17 years experience in professional cooking. Professional Cooking is basically cooking in a commercial kitchen and producing products which are sold to different range of clienteles. For example: Working in a 5 star hotel, flight kitchen, Cafes, Restaurants. "After completing diploma in HM from Pune and graduate diploma in Gastronomy, Adelaide, South Australia, I started Working as a Chef. I have worked in multiple hotels in India and abroad. Presently I am running my own Cafe by the name of Rahul’s Kitchen."